Sheila, the Log Lady is actually quite comparable to the much more expensive Gunnar in terms of ride quality and handling. Been extremely pleased at just how close it is to the Gunnar. That steel fork is exceptionally well designed. The Log Lady really is a steal for the price. Close enough, in fact, that the new Log Lady frame with fork at only half the price of a new Gunnar frame was a no brainer. The LL is light, agile, fast and nimble, just like the Gunnar. After all, it was designed to be a racing single speed MTB. As much as I hate to say it, the Krampus is a tank compared to the other two. The Krampus geometry and build, though, is very different. The Krampus, like most Surly bikes is overbuilt, designed for slugging it out on nasty single track, not for racing like my two single speeds. It's a great bike in its own right, but it rides much slower than the single speeds. Of course, those big fat 3" wide tires and rims on the Krampus do slow you down a lot compared to the lighter wheels on the single speeds. Love plus and fat tires, but when it comes to pavement riding, there's just no way they can keep up with lighter, skinnier standard MTB wheels and tires. Not going to happen. For instance, on our morning rides with my husband and his fat bike, I can just keep up if I ride a fat bike. If I ride one of the single speeds with their light 2.25" tires and wheels setup, I ride circles around him, I really do. Never underestimate what going lighter with your wheels can do for your biking. I'd rate it as number one for a performance mod. Works on MTBs, just as it does on road bikes. One of the easiest ways to lighten up a wheel on an MTB like the Krampus is to go tubeless with the tire. Really makes a big difference. Gets you a lighter wheel and better traction to boot. In fact, some bike companies are now going tubeless on their MTBs, right from the factory. Crankin', would love to send some of our cool weather your way. Temp, up here, at ride time, this morning, was only in the 50s. Had to bundle up with leggings and a sweatshirt. Did my usual 12 miles of pavement on the Gunnar, but spent the rest of the day doing errands, so no trail riding. Last edited by north woods gal; 08-29-2018 at 03:52 PM. I rode this morning, at 5:15 AM. It was my first true "dark ride," in that the sun was just poking through the clouds when I got back. I only rode 9 miles, as when I started out, I was going to ride to the other side of town and back, but there were already so many cars out, on Main St., that it didn't feel peaceful at all. So, I turned off to do a somewhat hilly loop, which was nice and quiet. It wasn't too warm, about 75, but grippingly humid. A front comes through tonight and the next 2-3 days will be nice. Of course, by Labor Day, it will be conditions like yesterday. We have a ride planned, that will most likely be modified! Sheila, most of their frames are more common steels like the 612 or the 4130, but they do offer a couple of pricier models in the 853. What I like about all of their frames, though, is that they are beautifully finished, not to mention nice and light and lively. Have been especially impressed with the steel fork on the LL. Does a great job of dampening and is also very stable. Really see no need to go with a carbon fork or a front shock, it's so good. 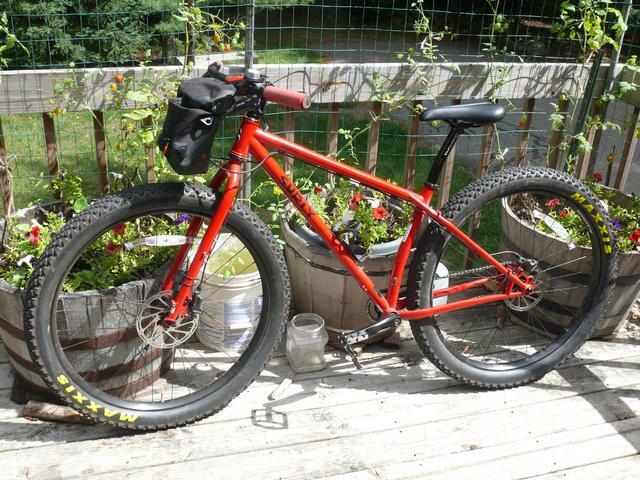 My factory built Log Lady weighs a touch over 23 pounds and that is very light for a fully built steel MTB. It's actually right there with my Gunnar, as I've mentioned. In fact, the welds on the LL are as nice as the welds on my Gunnar frame and those welds are done by hand. Goof for you, Crankin, to get out early and ride. I remember in my commuting days, me hitting the road to work at 6 AM, every morning. The world is a very different place that early in the day or so it seemed. Remember seeing fox and coyotes, running right down our very busy main street, that early in the day. I find it very meditative. That's why I was kind of disturbed this morning and turned off of the main road, which is not usually that busy at 5:15! I ended up doing less miles, but a climb. It may have to do with the very hot weather, as it was mostly outdoor type workers driving by. Sheila, my first choice was that Nature Boy 853, but it was completely sold out with no indication when or even if it would be back in stock. As I have discovered, late summer/fall is a terrible time to buy a new bike. The smaller companies don't build up a lot of inventory. Had I bought the Nature Boy 853, I would have converted it to flat bar, which is very doable with All City bikes, since they use the same frames for both drop bar bikes and flat bar bikes. They did have the standard Nature Boy in stock, but I really do need tires wider than 37mm to safely ride our paved roads. For instance, this year we've already had a heavy acorn crop with lots of green acorns littering the roads. Gets a little dicey riding over them with really skinny tires. We also have lots and lots of sand and gravel washing out on our roads and I do not like riding kind tires in that stuff. On to my next bit of news. Behold my new Krampus! If it looks like my old Krampus, it's because, well, it is my old Krampus, but with a new mod. Here it is. Nope, no derailleur and no gear cassette. My new Krampus single speed trail bike! Yipee! I worked long and hard on getting the gear ratio just right for my intended use of the Krampus with its big 3" plus tires. Even figured in the tire pressure I wanted to use. It's now a strictly trail single speed. Just picked it up, this morning, from the bike shop and hit the trail with it. Did a full 8 miles worth of laps and pleased to report I got it just right. It's geared so that I can do 90% of my climbing sitting in the saddle, which is important for the sake of traction. It's also geared low enough that I can keep the spin rate up for the techy sections. It's geared way too low and slow for road work, but that's okay, because I won't be using it on the road. I have other single speeds for that. 8 miles of trail work, by the way is the most I've done since the accident and just a bit more than my usual pre-accident workout. The fact that I could go 8 miles and want more tells me I got the gear ratio just right. This will get me more use for the Krampus. I really did not get along with the GX shifting when it had shifters and gears. Now I just jump on it and ride. Those 3" tires allow to ride all sections of trail, safely, too. At this point, half of my bikes are now single speeds. I blame my local bike guy at the bike shop for this addiction, by the way. He tells me that 90% of his riding is with single speeds. Seriously, though, it's great to have a local guy that knows single speeds and how to build them. He's the one that will be building my new Log Lady over the next month or so. It's going to be a real education for me. Oops! Almost forgot. I also did 5 miles of pavement work on my original Log Lady, this morning, on our daily morning ride. Beautiful weather, though cool enough to have to wear leggings, again. Fall really is knocking on our door. The ferns in our woods are already turning yellow and brown. Last edited by north woods gal; 08-30-2018 at 04:26 PM. Sorry, no, nothing in that size. Have plenty of longer ones, though. I usually keep a couple short stems of that size around, because it's the first thing I typically need to change on a unisex/men's bike when I get a new bike. Just me getting a proper fit on a new MTB. That, and having to trim the length on new factory supplied MTB handlebars, which are now coming in insane widths. A hacksaw is a girl's best friend. Yeah, the single speed thing is very addictive, all the more so for me since I've always been kind of a minimalist as far what I want on a bike, the simpler, the better. Yes, it was nice to know I had another forum pal, here that rode single speed, too. That helped. Thanks. As for shifting gears, I really, really don't miss it at all. I never especially liked it, anyway. These last few years, I've actually been more inclined to mash it out rather than shift, even though I probably would have been better off, shifting to a lower gear. Then, too, nothing screws up a climb like a bad shift. Then there's derailleur and shifter adjusting, problems, noise, blah, blah, blah. Those can be a real headache. Was initially worried about going single speed on some of the hills on my road routes, but have conquered them all, even my worst one, with one gear, so my confidence level is high using a single speed for most of my riding. Can't believe it's the last day of the month. What a month! I won't quite make it to the 400 mile mark, but I came close enough, probably finish around 375, depending on what I ride, today, between storms, which are in the forecast, yet, again. August was all about getting back in shape, anyway, not about breaking records, so, in that respect, a very good month for me. On to September and fall. Last edited by north woods gal; 08-31-2018 at 07:36 AM. I truly don't know if I could ride a single speed. Am I weird because I like shifting and it is one of the most intuitive things in cycling for me? 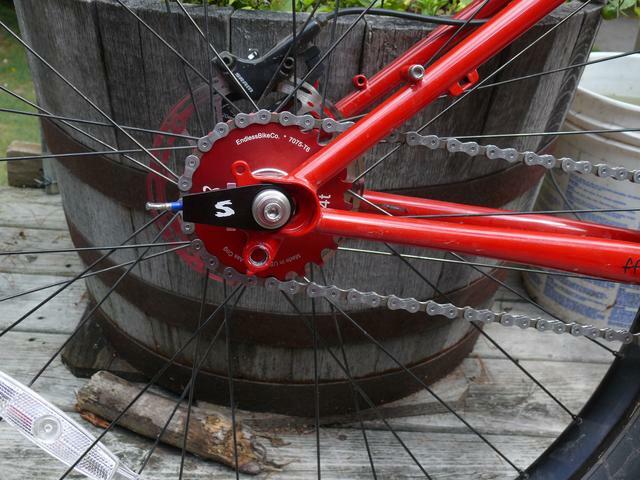 Electronic shifting has eliminated any issues with the derailleur on the bike I ride the most. There are huge climbs around here; not long, but short and steep. I can't imagine doing them on a single speed. Even with the really low gearing, I like preparing by shifting up and down and back up again. Gosh, no, didn't mean to imply that there's anything wrong or inferior to shifting and having gears on a bike, Crankin. My bad if it came across that way. If anything, we single speeders are the weird ones. Choosing to go single speed in this day and age of truly great shifters and derailleurs is totally a personal call and, yeah, a bit nutty. (As we all know, I'm definitely a bit nutty in a lot of my bicycling preferences in other things too.) No way would I ever try to talk anyone out of giving up their geared bikes for a single speed. Going single has a lot of benefits for my riding, but going single might be a really bad idea for some folks. One of those things you just have to try and see. As for hills, though, you'd be surprised at just how effective a single speed can be for climbing hills, but you have to carefully get the gear ratio just right for your area and you absolutely have to learn the proper technique for tacking hills with only one gear. Our area is about 85% gentle ups and downs and about 5% really steep climbs and, maybe, 10%, at best, actual flats. Have done every one of those steep hills with one gear, now, and try to include one or two of those hills on every ride for the sake of staying in shape. The gently rolling stuff, though, is a blast with a single speed. Lots of fun. In other words, single speeds are not just for riding the flats. We're off to the St. Pete's area in Florida, tomorrow, for one week while my DH attends a conference for folks with his disability. I'll be renting a bike and doing some riding in the area, though, as always, I'll have to take what I can get as far as a rental bike and area biking. Good tip, Sheila. Might have to try it. The forecast is for storms all week, down there, but, as always, I'll get out and ride, one way or another. No, those are a Salsa Bend 2 with 23 degree sweep. Nice and comfortable bar for my trail riding. Have to get a shorter stem, though. Have a 65mm on, now, and just too much reach for me, now, with my preference for riding more upright.